On 18th September there will be a new series of Cycle Sportive Challenge Events held in Cumbria. The Cumbria Rivers Ride includes three stunning bike routes for cyclists of all abilities. 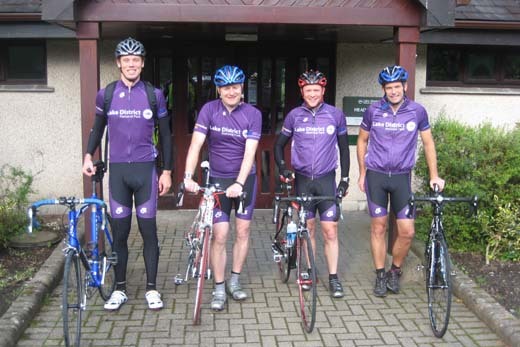 Rory will be riding for the Lake District National Park team which also includes the Chief Executive, Richard Leafe. A Cycle Sportive is a long distance, organised, mass participation cycling event on public roads and the Cumbria Rivers Ride will go through some of the UK’s finest scenery and cycling terrain. Starting and finishing in Keswick, the Cumbria Rivers Ride routes follow the path of the devastating effects of the 2009 Cumbrian floods from the heart of the Lake District all the way to the Irish Sea. This spectacular event is being organized by the Cumbria Community Foundation with the aim of raising money to support local charities. The Cumbria Community Foundation exists to help people in need in Cumbria. It does this by raising funds and distributing grants to voluntary groups. In 2009 the Foundation ran the Cumbria Flood Recovery Fund raising over £2.9m to help people affected by 2009?s devastating floods.